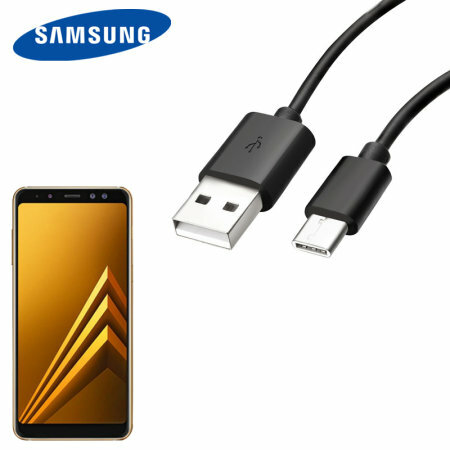 Perfect for charging your Samsung Galaxy A8 Plus 2018 and syncing files, this official 1.2m bulk packed Samsung USB-C to USB-A cable provides blistering charge and transfer speeds and also supports adaptive fast charging. I actually bought the single 1 first. After using it I ordered the 3 pack. Excellent value for money and fast delivery to. My new smartphone has a USB-C connection, so I needed to change the cable in my car for charging. The Samsung branding gave me confidence it would work well. Fast delivery at no charge ???? Yes, It's a genuine Samsung cable, what more do you need to know? These definitely work, fast charges my Samsung. I bought 3 as I found my cat was sneakily chewing all my fast charge cables, good price and good service as always from Mobilefun. Easy to find what I wanted on the website and followed by a speedy delivery. I Already know about the product, I'm very pleased with it and it reached me in no time at all, massive thank you for your efficiency! Samsung product complete with sealed packaging. Delivered promptly. Very satisfied with product, will be buying from this reliable site again in the future. Excellent product and genuine Samsung cable. Fast delivery too! Useful additional cables, easy to order, arrived in good time. Thank you! Bought as a replacement for the original one. Works as expected, great price and quick delivery, thank you. Quick delivery, product is as advertised. Happy with the product. 3 Samsung charging usb cables for this price is good value. Came well packed, what more do you want. Exactly what i wanted . Fantastic products, prices and service as usual with Mobilefun! Not entirely sure how to review these as are exactly per description. Set of 3 samsung usb c cables. Work great and happy with purchase. Arrived in good time also. Thank you very much. I am satisfied. The charger itself is great and its nice and long. I love it. I really wanted a spare cable for the car and I had bought an unbranded one but I kept getting a "slow charging" alert on my phone. I looked online for a good priced official one and I found it here. Delivery was speedy too ???? A+, fast charging and does as needed! It works. A little expensive. On time. It's so difficult to get a cable now which I needed for my car. The reason I chose Mobile fun is that they sell genuine products and can be trusted that they are. Genuine product, good and fast service. Cable is good quality. I needed the extra 0.5m as it was being used in the car. 100% satisfied, product ordered, confirmation received. Product arrived on due date. All good. Will use the Company again. Samsung usb cable, bought as a spare for using in the car. Pleased with product. I gave up buying cheap accessories as they were never authentic and either didn't fit or only charged slowly. These are authentic, fit, and fast charge. The only downside was the time it took for them to arrive. Oh and that I had to buy a pack of three, but they actually came individually wrapped. Official product at a great price with super fast delivery. I am very happy with this charger which plugs into a USB socket and fits my A3 2017 Samsung phone perfectly. It also charges quickly and was inexpensive to purchase. exactly what I wanted fast service .I would recommend this company . I purchased two because I wanted the Samsung brand and was pleased with the price. I was a bit concerned I would end up with some off-brand, sloppy-fit cable. I am happy to report that did NOT happen and have ordered two more. Well i was initially worried about the product when i placed the order, but when it arrived i was happy to see it was a genuine samsung cable which fits my samsung s8 and fast charges also. The delivery time was spot on, communication from customer service was fantastic, will definatly order mobile stuff from here again and will reccommend them to friends and family, also prices are very reasonable especially for geniune products. works just like my original Samsung usb. also charges very quick . How wrong can you go with a genuine Samsung cable? But. Good service and prompt delivery. It did the job, I ordered 2x cables but one was sent incorrectly, but another was sent free of charge. The product is very good,but delivery is a little bit slow. Just the same as came with the phone. Excellent service from mobile fun. Cable is exactly as described. Ordering process was easy and painless. Cable arrived quickly! I will order from here again! Excellent quality. Works perfectly with Android Auto! Needing a 2nd cable for new Samsung A5 this fitted the bill and was delivered within stated time. Everything I wanted was in the product. Order was delivered in good time and service was great, checked up on order to let me know when was despatched and products are great . Would recommend and use again. A girl can never have enough phone cables so it was very pleasing to be able to order and receive your three pack. I'm a bit miffed that I had to buy these at all, but the new phone takes USB C, so here we are. I like that this is a 3-pack, the perfect number, and relatively inexpensive, especially for branded cables. The one that came with the phone is for home, and these three are for work, my car, and my friend's car that I often find myself riding in when my phone battery dies. So far they all work as advertised, and are slim enough to slot into the phone without having to remove the protective case I bought. Shipping was not the quickest I have experienced, but they came soon enough, and were in perfect condition when they arrived, so the packaging was adequate. Now I just have to figure out what to do with the 5 micro-usb-to-usb cables that I had for my old phone. Are they recyclable? This cable is an official Samsung cable, as described, and even provides a fast charge for my s8. Delivery was prompt. Couldn't be happier. Official Samsung USB-C cables have so far proven to be reliable and as expected. Similarly, Mobilefun's support was great when the first parcel got lost in transit en route to NZ and a replacement package was promptly dispatched. As described, works perfectly, very happy. One of the cords stopped charging after 3 days. Sorry to hear that, please contact our Customer Services department. Arrived quickly and works great! Now have a charger for home, work and in the car. Product is fine,Price is right & Service is Excellent - as usual! These cables seem genuine from what I can tell. Good value for the three. Avoid 3rd party USB-C cables at the moment as there is very little regulation in their production and can lead to power surges that can damage your device. For now, you're safest buying genuine Samsung Cables. It plugs into my phone - what more could I ask? Cable is made of durable plastic. Both ends are of good quality and fit well with no "wiggle ".Slightly longer than a standard lead which is good. I'm using it both as a USB connection to my computer and also into a charging plug.Pleased with the purchase.